Jacob Klepacz, 32, died April 28. Flowers mark the site at 1530 W. Fullerton Ave. where he was found unresponsive and severely beaten. LINCOLN PARK — Chicago police detectives had few answers about the death of Jacob Klepacz for a frustrated and concerned crowd at a CAPS meeting Monday night. Two Chicago Police detectives attended the meeting to take questions, but were unable to divulge details of the investigation into the death of Klepacz, who was found on Fullerton Avenue last month in a case that has drawn high interest. "I can tell you we've made progress on the case, and that's really about it," said Sgt. Jessica Jones. Jones said the case was "going in the right direction" and that "the information we have is positive, moving forward." Klepacz was found beaten with severe head trauma at 1530 W. Fullerton Ave. during the early hours of April 28, according to police. His friends have distributed fliers in the neighborhood hoping to jog the memory of any possible witness who may have been near the area where he was found unresponsive. Jones praised that effort: "Any more information is always valuable to us, no matter how small the details might be," she said. "We've worked nonstop on this case." More than 100 people attended the meeting, including a Lakeview man who said he was beaten five months ago to the day, just blocks from where Klepacz was found. "When I heard it was the 1500 block of North Fullerton I was like, 'Oh, Jesus Christ,'" said Ryan Rodriguez, a 41-year-old Lakeview resident. Rodriguez said his case was never solved, and he was still paying medical bills. He has two titanium plates holding his jaw together, he said. Hearing about Klepacz on the news re-engaged him in the matter. "I'm a living victim," Rodriguez said at the meeting. "It could have happened to me. I could have been killed." Unlike Rodriguez's case, police have indicated that Klepacz met up with "the possible offenders" elsewhere in the city before coming to the Fullerton location. His attack was not random, police have theorized. 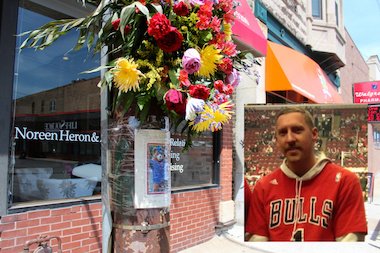 Friends said Klepacz had been at Timothy O'Toole's pub in Streeterville on the afternoon of April 27 watching the Blackhawks game, and he posted on Facebook that he was at The Dugout Sports Bar & Grill in Wrigleyville later that night. Rodriguez said he remained "furious" with the dead-end outcome of his case and hoped the same did not happen to the Klepacz family. "After several months, I literally gave up, and now that I saw this with Jacob, I thought maybe I do need to get reinvolved and see what I can do to help," Rodriguez said. Rodriguez said he was able to trace a credit card charge to a nearby McDonald's shortly after he was beaten by two strangers, but police never were able to get surveillance footage from the restaurant. Police said the Klepacz case remained classified as a death investigation, pending toxicology results from the Cook County Medical Examiner's Office. Friends of Klepacz have set up a Facebook page titled "Justice for Jacob Klepacz" and a Twitter handle, @justice4jacobk, to spread awareness.